Websites are about first impressions. Within a few seconds, someone visiting your site can start to understand who you are and begin contemplating if your church is something they want to explore more. One of the biggest turn-offs for users is a site that looks like it hasn’t been touched for years. 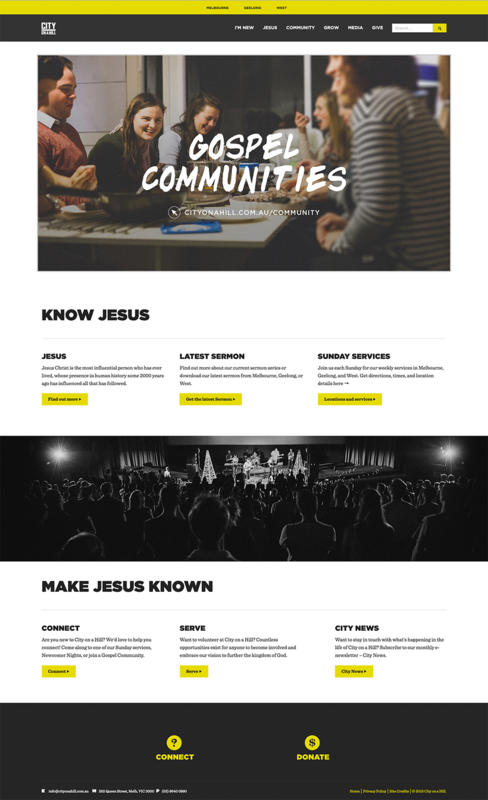 As you think about what first impressions you want your church to make online, here are some keys for modernizing your website. Image driven. A good first step is to add more images to your website. A better second step is to make them bigger. I laid out my case for using more images and videos in previous posts (here and here), but the truth is we live in an image driven culture. Visitors to your site are not going to sift through endless text to learn about you. They will quickly glance at the images to start deciding if your church is for them. Minimalistic design. Along with big images comes the need for less writing. Simple, minimal design leaves room for content to breathe. Open space creates breaks between different content areas and makes the site easier to navigate. Simple design isn’t easy. It takes a lot of restraint, editing and learning to say more with less. A guided experience. One of the most confusing parts of a website can be figuring out where to go to find the information you’re seeking. Think about the key audiences that will be coming to your site. What info do they need? What problems are they trying to solve? Use that information to structure your homepage in a way that creates clear paths of where someone, like a first time visitor, should focus their attention and click to get more information. Every piece of content you create should have a clear answer to “what do I do next?” Figure out your call to action and create the navigation to make that happen. Real representation. 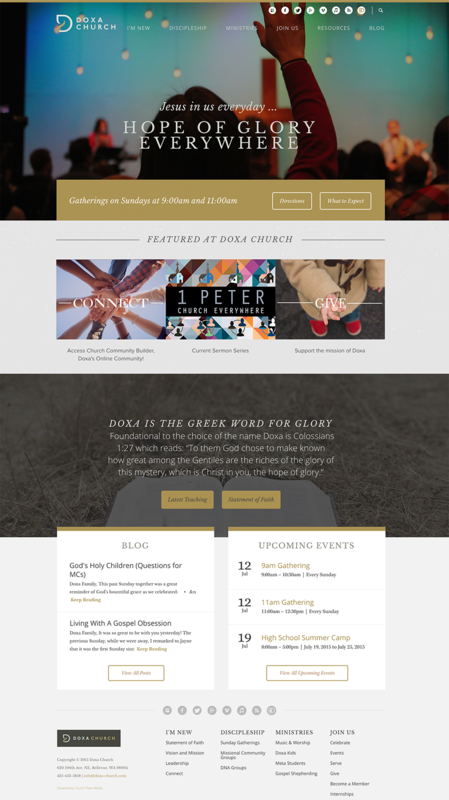 Visiting a church website should be like walking through the front door of the actual building. Think about the culture of your church and what it’s like to be a part of that. How can you show that on your website? Photos help, but think about colors, writing style, atmosphere, passions, programs, community, people and life-changing stories. The worst thing you can do it present yourself different online than in person. Often church websites don’t show the full greatness of who you are in person, and that’s a great problem. Hey Guys - this is a really great list of things to consider - and the examples are lovely. It does get me thinking though - there is an overwhelming consistency to the overall look of almost all these sites. I’m not sure if that is a bad thing or not - but it’s quite noticeable. Would love to know your thoughts? @Jordan: The similar look is a good point. I think part of that has to do with the fact they are all using modern trends like large, filtered images with text, flat design, bright colors and open space. The other part probably shows some of my own personal bias in design preference. In the end, it’s all about being true to who you are and creating a site that best tells your story. If you do that well, it’s less of a problem if it looks similar to another church’s website. Really quality resource for churches! I love everything your organization is publishing. How do you think the material design trend that google is going to be pushing for, is going to affect the church website design world? https://www.google.com/design/spec/material-design/introduction.html. 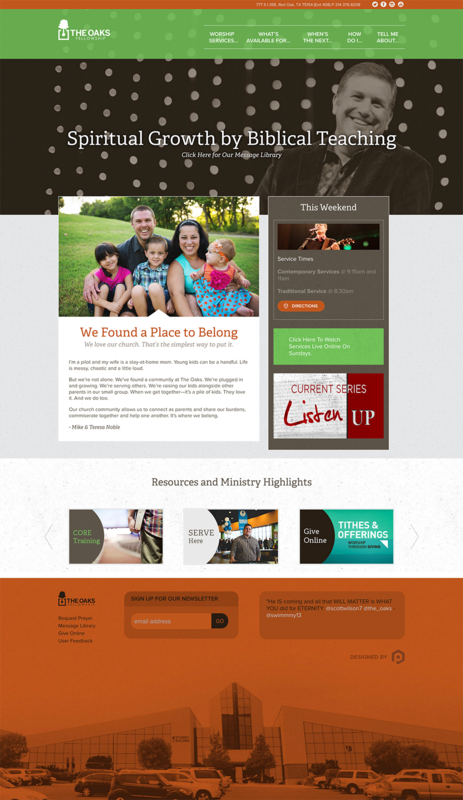 Here at https://ministrywebsitedesigns.com/ we’ve worked with thousands of churches all over the country, supporting their design and branding or providing them with tools to do it themselves. We’d love to share this article with our clients if its alright with you? Religion is a part of every people. but with the younger generation have become more techie, most of the religion or churches made their own websites and blogs as it attracts youth to become part of them and believe in the word of the of God.